If I were a major league ballplayer and someone told me I was being traded on April 1st, I’d think someone was trying to pull one over on me. However, trades do happen, even on days known for their practical jokes. Ed Ott was your average useful catcher: not great with the bat but solid behind the plate with a good arm. I remember Ott being one of my favorites as a young child, mostly because his name was easy to say and remember. Coming off of a decent 1980 season, Ott was dealt to the Angels with Mickey Mahler for Jason Thompson. The Pirates had a promising young catcher named Tony Pena ready to step in and needed a replacement for aging Hall of Famer Willie Stargell. Thompson was then immediately dealt to the Yankees for first baseman Jim Spencer and minor leaguers Greg Cochran and Fred Toliver, but the commissioner blocked the deal. This turned out to be a big boon for the Bucs. Spencer was instead dealt to Oakland midseason and was done the next year. Cochran never made the majors and Toliver bounced around as a middle reliever before ending his career pitching in 12 games for the 1993 Pirates. Thompson started at first for four years, hitting 31 HR and making the All-Star team in 1982. 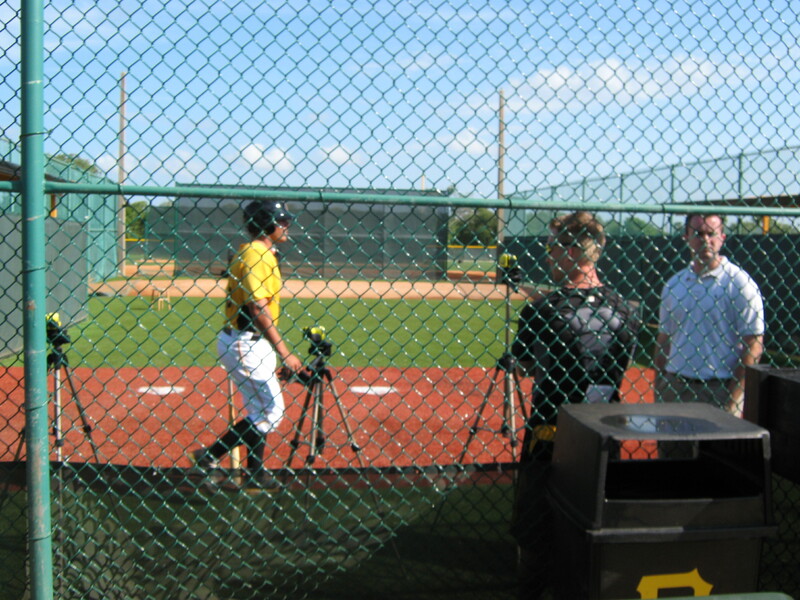 Thanks again to John Dreker of Pirates Prospects for bringing this deal to my attention. Be sure to read This Day in Pirates History for more on this deal and the Tony Pena/Andy Van Slyke trade which happened six years later to the day. My first trade tree was about the Jason Bay trade. Since it was the first one I did I hadn’t worked out all of the ground rules I now use, such as including every instance a player appeared with the franchise, even if it wasn’t directly related to the original trade I was working on. Damaso Marte was an below average left handed reliever for the Pirates in 2006 and a pretty good one in 2007 and 2008 before he was sent to the Yankees with Xavier Nady for Jose Tabata, Jeff Karstens, Daniel McCutchen and Ross Ohlendorf. 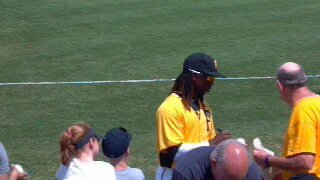 Marte’s rookie year with the team was in 2001 when he was acquired from the Yankees for Enrique Wilson. Before the next season began he was flipped to the White Sox for a younger, right handed reliever, Matt Guerrier. Pirates Prospects’ John Dreker has all the details on that trade in today’s This Date in Pirates History, but here’s the visual guide. I had high hopes for the Wil Cordero trade, as I’m sure others did too. It seemed like Wilson was a highly thought of shortstop prospect at the time, so getting him and a young outfielder for a mediocre veteran looked great. Alas, it was not meant to be. Club President Frank Coonelly gives a tour. 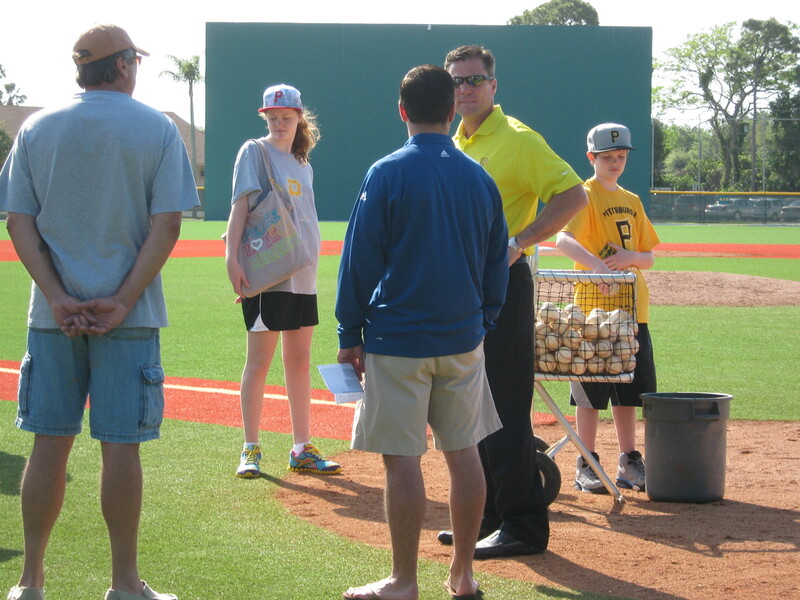 Steve Blass gave a similar tour earlier. 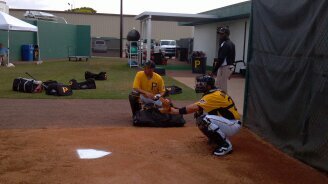 Tony Sanchez walks through the bullpen. 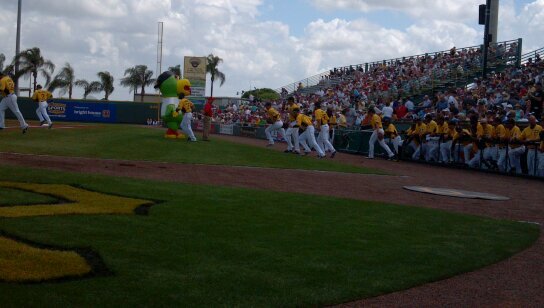 Sanchez about to step in the cage. 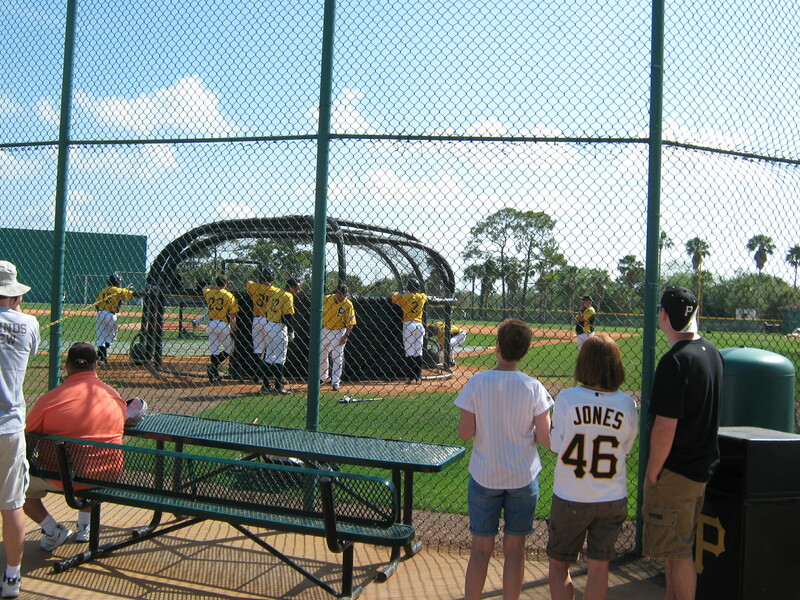 Starling Marte (#6) waits for his turn while Kris Watts hits. 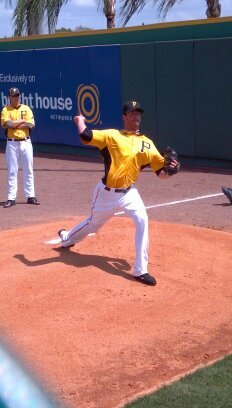 Kyle McPherson throws to Sanchez. “The Legend” Garrett Jones had a fan on site. The crowd was sparse when we arrived but filled in a lot by the time we broke for lunch. Autograph hounds float around too. Here, they descend on Tony Sanchez. The pictures turned out more Tony Sanchez-centric than I intended. Not pictured but seen running various drills: Stetson Allie, Gorkys Hernandez, Mel Rojas, Jr., and Brian Friday. Lunch was at the nearby Mixon Fruit Farm where my Dad and I ate with fellow Pirate fan Matt Brown. I had a tasty Cuban sandwich followed by this number for dessert. 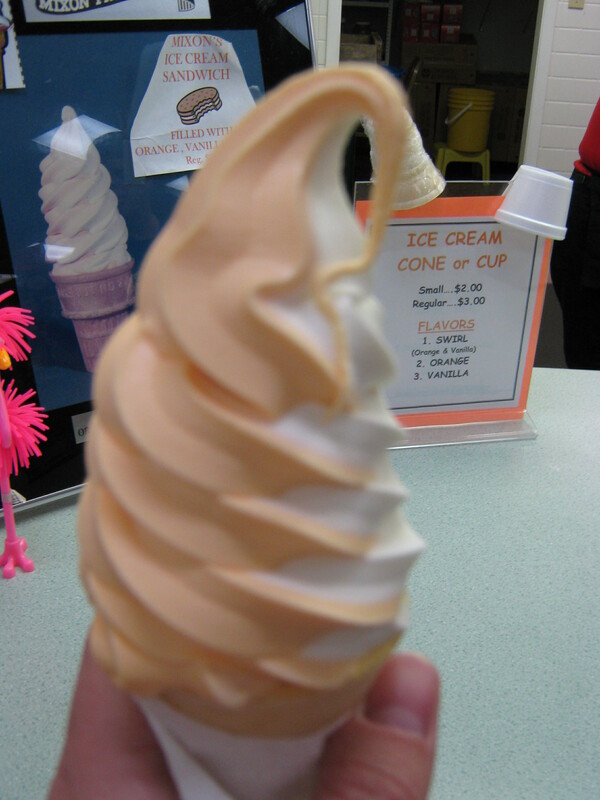 That is a swirl of orange ice cream made with fresh squeezed orange juice. It tasted just like a cream-sickle only better. Mixon’s came highly recommended and now I know why. 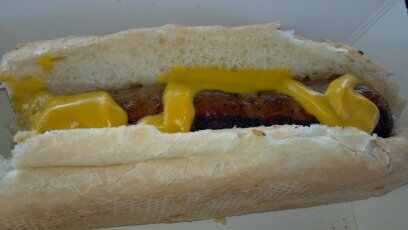 This will definitely become a regular part of our trips to Spring Training. 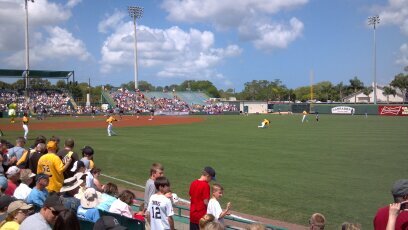 Coming up: Part II: McKechnie Field and the Tigers. The Pirates played a sloppy game and lost 8-6 to the Rays. Pirates Prospects has the down and dirty. MLB.com has the box score. Good: Yamaico Navarro went 3-4 with a HR and 3 RBI and looked pretty good in the field. Nate McLouth and Alex Presley pulled off a nice double steal. Up and Down: Rod Barajas hit a solo homer but was easily thrown out at second earlier in the game when he hit a high fly off the left field wall. Matt Hague was 1-1 after his pop-up to short was obscured by a flock of seagulls crossing from the right field grandstand to the left field grandstand. Bad: Pedro Alvarez. Oh, Pedro. 0-3 with 2 strikeouts. He also had a foul ball go off his glove. It was a tough play, but it just looks like the confidence isn’t there. 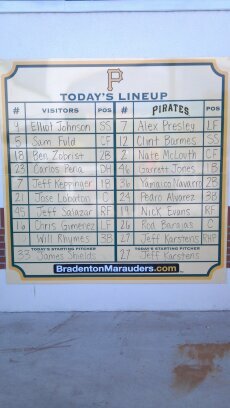 After the game, Clint Hurdle names Erik Bedard as the opening day starter. Players warm up under a beautiful sky. Gearhard line: One beer, one Pepsi, one sausage. 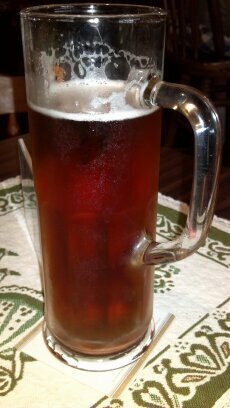 Dinner at Old Hamburg Schnitzelhaus, featuring a wonderful Oktoberfest brew. Dock started the All-Star Game in 1971 while winning 19 games for the World Series winning Pirates. In 1970 he threw a complete game no-hitter and posted the highest WAR (3.1) of his Pirates career. I always learn something new doing these. On this one I found out that former Astros, A’s and Mets manager Art Howe is a Pittsburgh native and started his playing career as a Buc. Today’s post was inspired by yesterday’s This Date in Pirates History post on Pirates Prospects. John Dreker goes into great detail on the Kluszewski/Fondy part of this tree, but I’ll stick with the more notable Pirate, Dale Long. Long was a firstbaseman for the Pirates from 1955-1957, making the All-Star team in 1956. He set a major league record that season by hitting a home run in eight straight games. Don Mattingly tied that record in 1987 and Ken Griffey Jr. did it in 1993 but no other National League player has made it to more than seven games. Four years later Long was on the 1960 Yankees team that lost to the Pirates in the World Series. He was 1 for 3 with a single in three pinch hitting appearances. There are 51 players at the bottom of the chart who are currently in the organization. Signed as free agents: Neal Huntington 9, Dave Littlefield 0, Cam Bonifay, 0, predecessors, 0. Draft picks: Neal Huntington 2, Dave Littlefield 9, Cam Bonifay, 2, predecessors, 0. Rule 5 picks: Neal Huntington 2, Dave Littlefield 0, Cam Bonifay, 0, predecessors, 0. Selected off waivers: Neal Huntington 5, Dave Littlefield 0, Cam Bonifay, 0, predecessors, 0. Acquired in trades by: Neal Huntington 25, Dave Littlefield 0, Cam Bonifay, 0, predecessors, 0. There is some cross over in the numbers that causes players to be double counted at times. The bottom line is that this is now Neal Huntington’s team and organization. He has acquired 40 of the 51 players listed, for a winning team that is one game out of first place at the All-Star break. Up to this point, I would label him as a success.